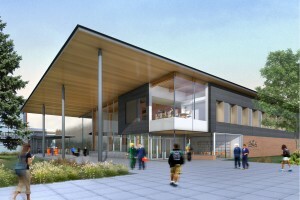 Studio 9 has been working alongside Architects of Record, Stantec, to improve the trades training facilities at Selkirk College’s Silver King Campus in Nelson BC. Rounding out the team are project managers Colliers International, structural engineers Fast + Epp and Rocky Point Engineering for mechanical upgrades. Selkirk’s trades and training programs have been in existence for 50 years and many of its facilities are in need of upgrades. Plans are underway for a new administration and student building that will become the new face of the campus. Part of this massive campus facelift will include a brand new building for the carpentry program and extensive upgrades to the existing trades buildings. Construction of this multi-phased development is scheduled to begin this November with everything wrapping up in 2018. 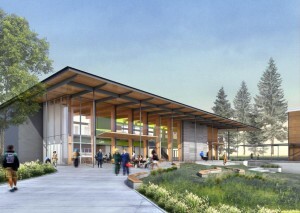 More news on Selkirk’s $18.9M upgrade can be found here. The shroud of scaffolding surrounding the Savoy Hotel has finally come down revealing a new look for the Savoy Hotel! This turn of the century building has long been a prominent corner piece on the south end of Nelson’s historic Baker Street. The new look features diamond patterned zinc cap over the original red brick walls. Wood elements will finish off the exterior detailing at the street level. As architects for this development, Studio 9 has orchestrated a diverse team of professional consultants, suppliers, and trades people to pull everything together. 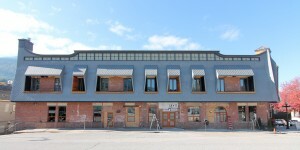 From the beginning, Studio 9 has worked with owners Jimmy Bundshuh and Jenna Arpita who have poured a lot of love and attention to detail into this building that has experienced some neglect in the years leading up to their purchase of it. The new Savoy is rapidly becoming Baker Street’s most lively hub of entertainment, food, and accommodation. The Savoy now offers Bloom Nightclub, Falls Music Lounge, and Savoy Brewery, with Farm Fresh Cafe to open soon and the Savoy Hotel to follow soon after. 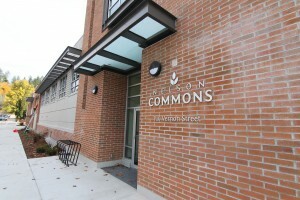 Nelson Commons, the mixed use development spearheaded by Kootenay Co-op natural foods store is nearing completion! 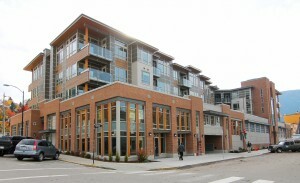 The 54 residential units are finished and people have already started moving in. The Kootenay Co-op store is due to open late fall/early winter and will offer three times the floor space as their current location with a full sized commercial kitchen, deli, cheese shop, frozen fish section, and an in-store restaurant. 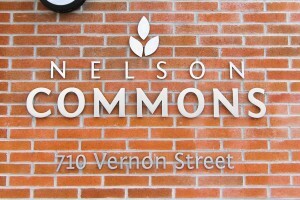 Studio 9 has assisted the Kootenay Co-op development team since the beginning of this venture and is proud to have served what is sure to become one of Nelson’s most successful commercial and residential developments.